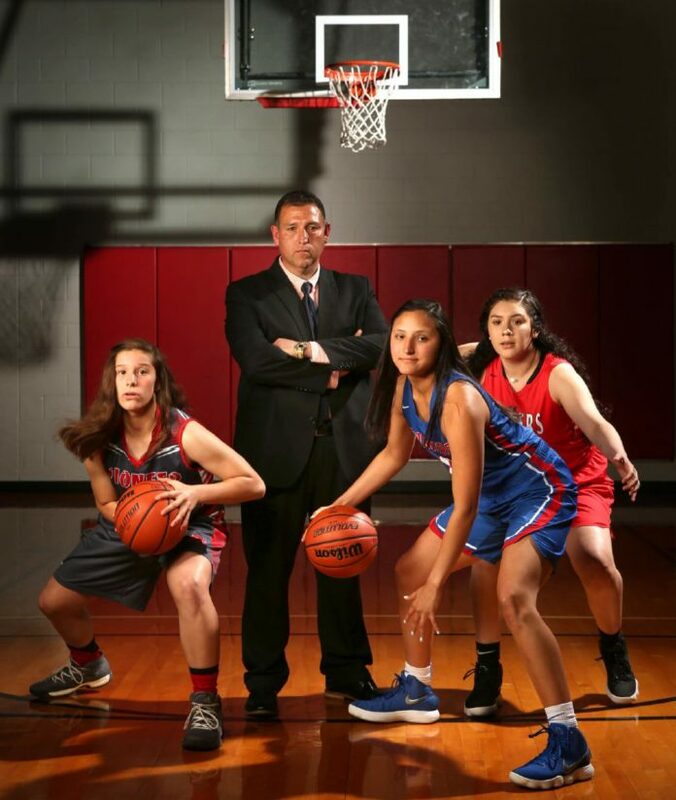 The Monitor's All-Area Girls Basketball Team includes Newcomer of the Year Andrey Hornaday of Sharyland Pioneer, left, Coach of the Year Saul Arjona of Hidalgo, Player of the Year Jayla Santa Maria of Edinburg High and Defensive Player of the Year Jocy Amaya of Rio Grande City. Briana Peña, senior, guard, Weslaco High: Peña, The Monitor’s 2017 All-Area Player of the Year, led the Panthers with 16.5 points per game during the regular season. Jackie Howell, junior, forward, Mission Veterans: Howell, who averaged 16.5 points, 9.6 rebounds, 2.0 steals and 1.3 assists, makes her first appearance as an All-Area First Team performer after making the Second Team in 2017. Melly Palacios, senior, guard, PSJA North: After posting 15.2 points, 3.6 rebounds, 3.8 assists and 4.7 steals per game, Palacios won District 31-6A’s Most Valuable Offensive Player and was a member of the All-Defensive Team. Ashley Arjona, senior, guard, Hidalgo: The daughter of The Monitor’s All-Area Coach of the Year Saul Arjona, Ashley averaged 8.4 points, 9.3 rebounds, 12.2 assists, 8.6 steals and 1.4 blocks. Tani Talamantez, junior, guard, McAllen Memorial: Talamantez’s 13.9 points, 2.5 rebounds, 5.1 assists and 3.8 steals led the Mustangs to an undefeated season in district play. Mercedes Hernandez, senior, guard, Edinburg High: Hernandez (10.3 points, 4.4 rebounds, 3.5 assists, 3.2 steals) was one of two Bobcat guards to average at least 10 points, four rebounds and three steals per game. Barbie Gutierrez, junior, forward, Hidalgo: Gutierrez will be a key returner for the Pirates after averaging 15.5 points, 8.5 rebounds, 2.1 assists, 2.2 steals and 2.4 blocks in 2017-18. Brianna Coffee, senior, guard, McAllen High: Coffee is an All-Area Second Team player again after averaging 15.3 points, 2.8 rebounds and 2.1 steals in her final season. Jenessah Santa Maria, junior, guard, Edinburg High: Jenessah (10.8 points, 4.2 rebounds, 2.9 assists, 3.2 steals) is a younger sister of Jayla, The Monitor’s All-Area Player of the Year. Jovanni Solis, senior, guard, McAllen Rowe: Solis was the Upper Valley’s second-leader in scoring at 19.3 points per game.